Today’s guest(s): Andrea Alberti, youth minister at St. Thomas Parish in Nahant and St. Mary High School, Lynn; and Chris Carmody, youth minister at Immaculate Conception in Salem and religion teacher at St. Mary High School, Lynn. 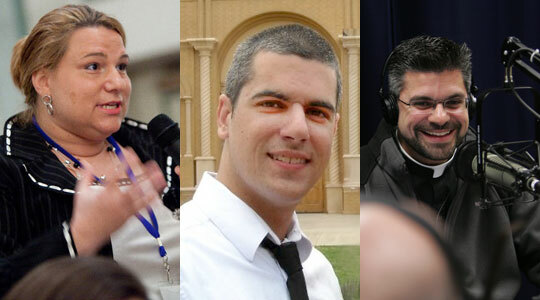 A summary of today’s show: Andrea Alberti and Chris Carmody share the amazing story of 350 youths on the Hunger for Justice Retreat fasting from Good Friday to the Easter Vigil, while serving the poor of their community, experiencing God’s love and mercy in the sacraments, and raising tens of thousands of dollars for charity. Thousands of youths have experienced one of the 27 retreats and have borne much fruit in the Church. 1st segment: Scot said that one of the things he hears so often working for the Church is the concern that we are not doing enough to engage young people in our Catholic faith. Behind this concern is the hope that we can figure out fresh ways to present our faith so that it connects with young people and sparks their interest to make a commitment to it as teenagers and adults. Today’s broadcast of The Good Catholic Life will give us all hope. What Andrea Alberti and Chris Carmody are doing up on the North Shore really works. The Hunger for Justice retreat they organize on Good Friday and Holy Saturday attracts 350 students, who participate in carrying a cross through the town of Nahant, serving the homeless in Boston, and then experiencing together the joy of the Easter Vigil. Also today, we will hear a special message from Bishop Robert Hennessey about the Sacrament of Confession and its availability each Wednesday evening during The Light Is On For You campaign. 2nd segment: Scot and Fr. Matt welcome Andrea Alberti and Chris Carmody to the program. This is the 27th time that Andrea and Chris have run the Hunger for Justice retreat. Andrea said it is now celebrated during the Triduum, but it started just as a service project with 6 confirmation students at Immaculate Conception Parish, Newburyport, who wanted to do something about the fact that children are dying every day. Chris was one of those students. They made a difference by fasting from food and any other kind of luxuries and got sponsors for each hour they did this, raising $7,000. Last Good Friday, they had 350 students who raised $25,000 that went to a hospital in Haiti. Scot asked Chris about what attracted him to do this as young person and who are the young people who take part in the Hunger for Justice retreat on Good Friday. Chris said it started when he was a freshman in high school and he remembers the adults in his parish who were so on fire with Christ and invited the kids to understand poverty, especially since they didn’t see it growing up in Newburyport. As part of the retreat they walked miles for whatever water they needed because they had seen videos of poor women and children who walked for miles every morning and night for their water. The kids who come now see a need and feel a call from God in their hearts, knowing that they can make a difference, they can do something about it. They are God’s hands and feet. What is the experience for the kids on the retreat? Andrea said they always try to begin everything around the sacraments, in an intimate relationship with Jesus. Their axiom is “Rules with Relationship = Rebellion.” They could get students who have been in Catholic school for 11 years but can’t relate what it means that Christ died on the cross on Good Friday and don’t understand the basics of their faith. So on Good Friday, they get to carry the cross literally. They hear the Gospel message that Christ loves them so much He died for them. Fr. Matt last year preached for the kids on the beach during a prayer experience. There are sometimes kids who come because their parents make them because they got in trouble. One part of the experience is that they go into Boston to serve the homeless. Last year, they brought 2,500 pairs of socks into Boston and 2,000 sandwiches and the students were sent out to interact with the homeless. At one point they ran out of socks. This one boy who had been forced to go by his mother because he had got into trouble came up to Andrea to ask for more socks for a homeless man and when she said they didn’t—on this freezing, cold Saturday—he gave away his own socks to the man who needed them. It is conversion on every level. Kids who are already in a relationship with Christ can go deeper on this retreat. Kids who have never met Christ can have an encounter with Him. Scot noted that the students fast from food for 35 hours and in the midst of the fast they hand out sandwiches. He remarked that it must be very difficult for them when they’re hungry. Andrea noted that this is usually the first fasting experience for most of these students. She thinks that the retreat has grown so successful because the fuel that power it is prayer, fasting, and sacrifice. The kids are amazed that they can do this. When Chris did this, the kids worked in a soup kitchen cooking hot food and serving it. One year, the kids baked cookies and said, “Are you kidding me?” but the youth ministers encouraged them that they could do it. They see the power of fasting and the power of prayer. Scot asked Fr. Matt what it’s like to see kids experience this retreat during the Triduum. Fr. Matt said he prays every day that God would raise up men and women who would not be afraid to mentor young men and women in the faith. What makes the Hunger for Justice experience powerful is that there is a core group of people who make young people a priority in their life and they are willing to pour out their lives for them. Kids respond to that. He remembers being on that beach on that Good Friday, just before noon, before the Way of the Cross to the Church for the Good Friday service, seeing those 350 kids and to have the opportunity to preach the Gospel to them. All of the people present thought this whole drama was real. And then student’s dad explained that this is what happened to Christ, that He was falsely accused and crucified on Good Friday. There was a beautiful moment of openness where they were receptive to hearing what Jesus Christ did for them. That’s why they are able to fast. When the reality of Christ’s sacrifice becomes real to them, they can then endure the 35 hours of fasting. 3rd segment: Fr. Matt said that last week, they had Bob Rice on the program and he spoke of the importance of evangelizing young people in the classroom, that when we’re catechizing them, we’re not giving them dry facts, but we’re witnessing to them and they experience Christ through us. He asked what makes Hunger for Justice so effective? What is it about their experience of the way the Gospel is presented that sets young people on fire? Andrea said it comes down to the sacraments of the Church. We often have such low expectations of young people, but really they want the truth. Their hearts are restless, until they rest in the Lord. They want to know about the One True Church and we shy away. This retreat is bold. The leaders of the retreat are challenged to daily Mass in preparation and say a daily Rosary. The kids are challenged to take their faith seriously and when they do their lives are changed. Amazing things happen. Fr. Matt reflects that so often when he celebrates Mass, he sees so few young people and those he sees look bored. But Andrea is saying something different, that when they are challenged and are exposed to the beauty of the Church something powerful happens. If we know of a teen who has an apathy toward the faith, what can a parent do to help them to know Jesus Christ? Andrea said you need to build a relationship with them, but first let your own faith grow. You can’t give what you don’t have. Your own life has to be rooted in Christ. You have to be a witness. We die to ourselves and Christ lives in us. All of our conversations on whatever topic, all our interactions, will have Christ at their heart. And when they say No to our first overtures, we should say Why not? The world pressures them to fall away from Christ, so we should persevere to give them what they are truly hungering for. Chris said Hunger for Justice makes Christ alive for them. They hear about Christ and they know facts about Him. But the retreat makes Christ a person to them. Like Mother Teresa would say she saw Jesus in the people she served, so too the kids see Jesus in the poor people they encounter on this retreat, as well as the adult leaders, during the Easter Vigil Mass, in the confessional where hundreds of kids all go to confession with 15 different priests. Scot brought the discussion back to the retreat itself. We know it starts on the beach with a moving and attention-grabbing beginning, followed by a procession of the cross to St. Thomas Parish in Nahant. Andrea said it takes 7 students at a time to carry the cross and they rotate in to help carry. Andrea grew up in the parish and last year she said she’d never seen the church more full and had never seen a more reverent congregation. They knew what was happening because they’d just heard the Gospel preached. They are an inspiration to the older people in the pews. They sat quietly for hour after hour. After that service, they head to St. Mary High School for a final meal and fast until Saturday after the Easter Vigil Mass. At the school, Chris said they eat the meal together and then get into small groups for group-building activities. They are not just serving the poor, but also serving one another. The kids come from many different parishes and this helps the teens to overcome shyness and awkwardness to relax and enjoy. Then they watch the movie “The Passion of the Christ”. When they survey kids after the retreat on their favorite parts of the weekend they consistently say it is “The Passion of the Christ” and the Easter Vigil Mass. They take time to process what they saw and there is a time of prayer and healing. Taking up the retreat theme of “From Darkness into Light,” they have a “glowstick” party and a time of fun. Then students sleep in cardboard “homes” where they sleep for the night. No pillows or anything. The girls are in the school cafeteria, the boys are in the gym. Chris said that on Saturday, they get up early and get on buses to go to Boston. They are broken up into three groups and they split up for three different locations: Boston Common, St. Anthony’s Shrine, and Pine Street Inn. They hand out whatever they have to the homeless. But the point is to stop and talk with the people they serve. The kids are amazed to have their preconceptions shaken up. Many of the homeless are educated or from good backgrounds who have fallen on hard times or just struggling. The kids are rotated by group through St. Anthony’s Shrine where they hear a talk on God’s mercy and confession. They have the opportunity for confession. Chris and Andrea said about 99% of the kids go to confession when given the opportunity, which Scot said it was positive peer pressure. Chris said about 10 or 12 priests available, including many of the Franciscans as well as pastors from the kids’ parishes. The kids encourage each other to go to confession and talk about what it means for them. 4th segment: Their work of service doesn’t end here. They return to St. Mary’s in Lynn and the leaders explain that after receiving absolution, they can now be filled with Christ to go out and evangelize and serve. They serve locally within Lynn in their small groups of 8 to 10 to homeless shelters, an orphanage, the local YMCA, the St. Vincent de Paul store. They do spring cleaning in every parish church available. Having fasted since the previous day, they continue to work hard with passion. It is rooted in what they see Christ did for them on Good Friday and now they serve others. Then they prepare to go the Easter Vigil Mass. Scot asked for how many is it their first Easter Vigil experience? Chris knows that is the first time for most of them because you can see it on their faces when they encounter the darkened church. They start on the Lynn common outside of St. Mary church for the candle-lighting ceremony and then process into the church singing. They get the kids as involved as possible, so they act as readers and servers. Last year, one of the youths was confirmed at the Vigil. While they’re nervous at first at the unfamiliar Mass, they enjoy it immensely. Scot said it is the longest Mass of the year, but so moving. The Exultet that is sung in the darkness, with just the one candle, is a tremendously moving experience and song. Then it is followed by the 7 Old Testament readings that take us through salvation history, and the New Testament, and the Gospel and any rites of initiation. It’s a catechesis of our whole faith in the one Mass. Fr. Matt said that over the previous 35 hours they’ve heard the Gospel, they’ve seen the suffering of the poor, they’ve been invited to give of themselves. There’s something about the power of fasting that enables us to empty ourselves and make us think of others and the essentials of others. There’s something about everything they experience that tills the heart so that they can experience the Mass anew. Without the relationship with Christ, Mass would be a boring routine, but after this weekend they have a new appreciation for the Mass. Andrea said she knows of three priests who heard their call to their vocation at an Easter Vigil Mass. They hear from some kids every year how shocking it is to realize that having fasted for so long that the first meal they receive is the Eucharist, that they understand that is truly Jesus. they are empty and they receive Jesus, and they say that this is how they came to the retreat: Empty, but now filled with Christ. when that epiphany happens, it is a beautiful moment and they pray for their openness in that moment so that the Easter Vigil is the pinnacle event. Fr. Matt notes that in their normal lives they are so full—full schedules, they get pretty much anything they want—yet the seem so spiritually empty as well. Andrea said that they see that so many of them “have it all” and it doesn’t bring happiness. All these things of the world do not bring contentment and teens will admit that quicker than many adults will. That emptiness that they feel is the heart’s longing for God’s love. When this is revealed, that hunger for love is obvious on their faces. This is the message that works. This is the 15th year of doing the Hunger for Justice retreat during the Triduum and the 27th overall. Fr. Matt said that he knows that there is a ton of work that goes into making it happen. Andrea said it takes a year of planning. They start meetings with adult leaders 2 months out. They train youth leaders. They start bulletin announcements 3 months early. They put a cross in the back of churches that are participating with requests for supplies such as cases of Gatorade or water or other goods for the poor. The whole parish participates in the evangelization efforts of the youth. Chris said there are many adults who are involved in all the details. For example, there’s the cardboard needed for the kids to make their cardboard houses. They need huge piles of cardboard for all 350 kids. They also have to provide lots of juices and other drinks for the kids while they fast. They have a leadership track of 70 high school students who have been on the retreat before. They meet every Wednesday night to help plan the retreat. Last weekend, the peer leaders spent another weekend on retreat to prepare for the Triduum weekend. And as much work as the logistics is, prayer is even bigger need. They get all the adults and all the kids to stay in prayer. One of the many fruits is the 70 high school leaders. Andrea said 21 of the young men among them went to a St. Andrew’s Dinner, which is an event held at St. John’s Seminary for young men who might be discerning a vocation to the priesthood. These are kids who are going to go deeper in their faith, building on the experience of the retreat. They go out to evangelize their world. 75 of the kids went to the March for Life in Boston. Every Tuesday at 7:15 am, before school, at St. Mary’s, they 50 or more kids who come to pray in their chapel. Anytime they have a reconciliation opportunity at the school, they have 99% who show up. Andrea said Chris himself is one of the fruits of the retreats and there are others like him who went on the retreats and who are now students at Franciscan University of Steubenville, and planning to become youth ministers themselves. The retreat is open to all high school-age students. First, check to see if your parish is one of the 12 currently participating as a group, but the St. Mary High School website also has registration information (see link above). There is also a Hunger for Justice group on Facebook (see link above). Chris said that in the week’s before the retreat the kids ask family, friends, neighbors, and parishioners to pledge donations. They emphasize that they need to give everyone an opportunity to be generous of whatever amount they can afford. Last year, they sent the funds to Hospital Albert Schweitzer, just outside of the capital. It was one of the few hospitals still functioning months after the earthquake. A family from Nahant knew of the hospital and its need for basic medical supplies. This year they will be sending the money to Japan. Anyone who wants to donate can send a check to Andrea Alberti, St. Mary’s High School, 35 Tremont Street, Lynn, MA 01905 and make the check payable to “St Mary High School” with “Hunger for Justice” in the memo line. 5th segment: It’s time to announce the winner of this week’s WQOM Benefactor Raffle. Our prize this week is a copy of the book “Seven Pillars of Catholic Spirituality,” a great book by Catholic writer Matthew Kelly. Kelly describes the pillars of Confession, Daily Prayer, The Mass, The Bible, Fasting, Spiritual Reading and the Rosary in a compelling way. This week’s winner is Theresa Rose Verhault from Stoneham, MA. Congratulations to Theresa.